I know I'm a little late (by, like, 3 years) to the This American Life (Mutual?) Admiration Society, but I just want to note that after rediscovering the show while driving back from the St. Louis airport after the wedding, I'm obsessed. Ira Glass is now my co-pilot, bringing sanity and wit as I design pages and write stories. I've combed heftily through the archives as I toil late nights on things like special football tabs (hence the tonight's 5:52 CDT 6:52 EDT, whatever, timestamp), but I'm still convinced that the best show is the very one I happened to find on that fateful afternoon on KWMU as I drove I-44: "Pro Se". Specifically the first act from Jon Ronson (maybe my favorite contributor, from what I've heard. 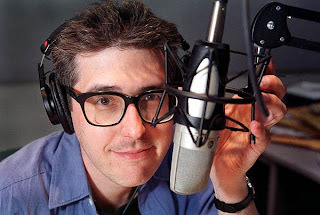 Bought the Ira Glass book, too, mainly for Michael Lewis (of whose works I found a pretty extensive archive), but all of the pieces are great. So basically, I'm all in now. How is it that you allowed me to miss this boat in college? I'd be interested in hearing each Sad Bear's favorite show.